The Megger Model ERTS, Electronic Recloser Test Simulator unit is designed to interconnect to Megger Models MPRT, SMRT, and FREJA 400/500 relay test systems for easy field testing of electronically controlled reclosers. The ERTS has 14, 19 and 32 pin cable adapters to directly interface with the most common forms of reclosers such as the G&W Viper®, Elastimold® MVR, with SEL 351R and SEL 651R, and Cooper Forms 4, 5 and 6 reclosers. 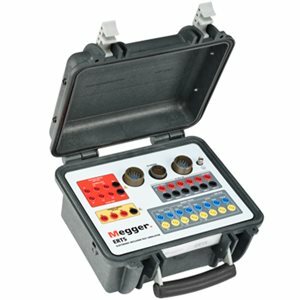 The ERTS provides the interface between the Megger relay test system and the recloser. The ERTS is used to test both the electronic recloser control and test the electrical operation of the recloser. The three different multi pin connectors provide flexibility in the different types of reclosers that the ERTS can simulate and test. The Megger relay test units provide the individual test currents and voltages through the interface unit, and monitor the individual trip and reclose circuits from the simulator.